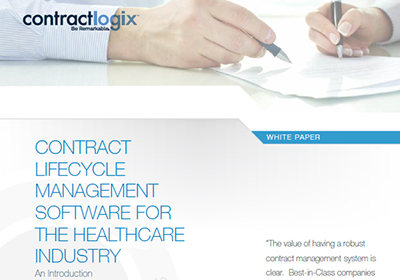 Contract Lifecycle Management Software for the Healthcare Industry. Professionals such as you, who work in the healthcare industry, are faced with evolving compliance requirements that are both challenging and time-consuming. And this complexity is reflected in your organization’s contracts. The arduous process of managing various physician and service agreements, along with regulatory compliance standards, such as HIPAA, JCAHO, and other state and federal regulations, are causing organizations like yours to seek healthcare contract management software that will simplify and streamline their contract lifecycle management (CLM) process.